John Speed, America. London, 1626. 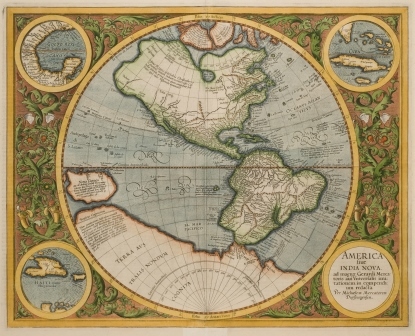 Speed's steel-engraved, hand-colored view of "America" shows the post-Columbian "New World." It includes attractive cultural border decorations, but perpetuates the Spanish myth of "California as an Island." Photograph by Paul Mutino. 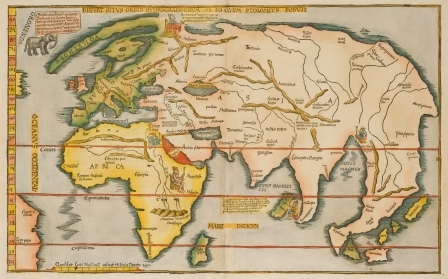 This version of Waldseemüller's famed 1513 "Admiral's Map," honors Columbus with a hint of later New World discoveries. Europe and Africa are well shaped; kings of Russia, Egypt, Ethiopia, Taprobana, and Mursuli are added, as is an elephant off Greenland. In 1520 Fries also adapted the Waldseemüller 1507 world map, the first to apply the name "America." Photograph by Paul Mutino. Ortelius's Azores map has three cartouches and a ribbon title, turning a document of relatively little information into an artwork. Columbus, returning from his first voyage, visited Insula S. Maria (lower right). Photograph by Paul Mutino. 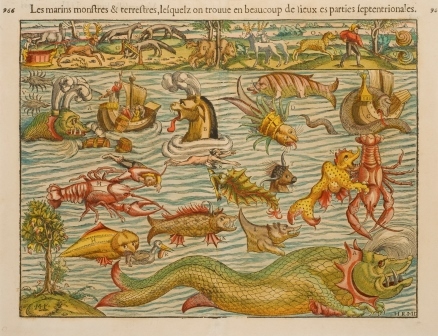 Renaissance mapmakers always enhanced their product by adding decorative elements, making it more attractive to buyers. Münster outdid them all by cataloguing the many invented monsters he used. Photograph by Paul Mutino. 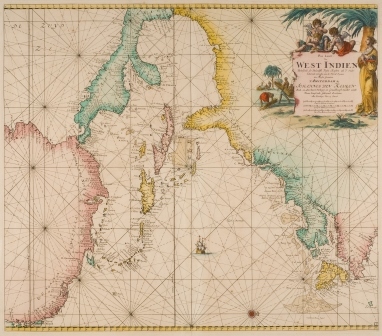 Van Keulen, one of the great Dutch sea-chart makers, represents the Caribbean Sea and surroundings with North to the right, and includes angular rhumb lines, all for the convenience of the navigator. Photograph by Paul Mutino. 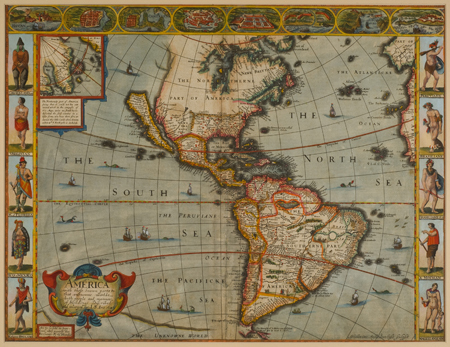 Featuring more than 30 European-made maps and sea charts inspired by New World exploration, and published between 1511 and 1757, this exhibition presents a fascinating study in geographic and human progress, as well as a feast for the eyes. Many of the woodcuts and metal plate engravings have original hand-applied color, as color printing was not yet available. 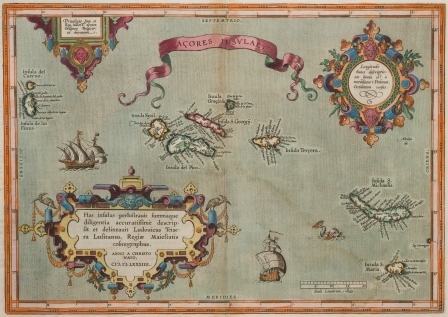 “These ancient maps represent Renaissance-period attempts by European ateliers to edify their clientele by revealing our ‘new’ hemisphere and its approaches, as discoveries and claims came ashore from those daring enough to pack their sea bags and head for the unknown,” says Jack A. Somer, who owns the collection. Somer has organized the show at the Bruce Museum along with Anne von Stuelpnagel, the Museum’s director of exhibitions. The exhibition is generously supported by The Charles M. and Deborah G. Royce Exhibition Fund. This exhibition is on display in the Bantle Lecture Gallery. Please note that occasionally this gallery is closed for programming during Museum hours. Please call ahead (203-869-0376) to make sure the gallery will be open during your visit.